Whitby Town scooped their first double of the season on Saturday, after following up October’s 5-1 victory at Rushall Olympic with a hard-fought 2-1 success, at the Turnbull. Player-boss Darren Williams put his team’s second half upturn down to “a good telling off” from him at the break. 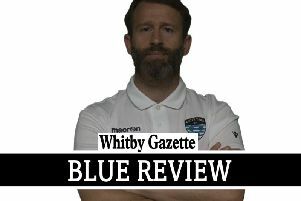 “It was not a good first half from us,” he told the Whitby Gazette, “but a completely different second half, we dominated the game and deserved the win. “Credit to the lads for their reaction in difficult conditions,” he added. Williams made one change from the side that lost 1-0 at the same venue seven days earlier, against title-chasing Buxton. Centre half James King began another loan spell from Bradford City and he replaced Niall Doran, as Liam Shepherd returned to his favoured midfield role. Town’s Walsall-based visitors forced the first clear-cut opportunity though, inside ten minutes. It was an inswinging right-wing corner that was nodded goalwards by Josh Craddock, with the inside of a post and Shepherd’s head combining to keep the ball out, amid strong claims it had crossed the goal-line. Midway through the first half, Shane Bland dived full-length to his right to keep out Jake Heath’s low drive, while at the other end, Ryan Price did well to parry Steven Snaith’s close range shot after Dale Hopson laid the ball off. Skipper Mark Robinson, playing in an advanced role on the left again, then fired across the face of goal and wide from the edge of the away side’s box. Richard Sneekes’ men grabbed the lead two minutes before half-time. Carl Palmer’s ball over the top found Aaron Williams in acres of space, six yards out and he gleefully poked past a helpless Bland for a deserved opener. Following their manager’s interval rant, Whitby began the second half more purposefully, but failed to worry the visitors until the hour mark. Snaith had time and space, only to sidefoot wide from similar distance to Rushall’s successful strike. Rushall then fired back with Kris Taylor hammering a 25-yard free-kick straight at Bland, who patted down then clutched the loose ball. Moments later, Taylor repeated the feat from slightly closer in, only for the same result as the ex-Middlesbrough keeper clung on. Robert Nolan, a recent signing from Blyth Spartans, replaced James Brown up front on 67 minutes, with Doran on for Shepherd soon after. Both substitutes were soon in the action and Town levelled on 73 minutes as Nolan got to the byline and put over the perfect right-wing cross for Snaith’s diving header to connect from point-blank range. Suitably stirred, the Blues went in search for another goal and found it within six minutes. This time it was Hopson who reacted first to a rebound following a sustained Town attack, to smash first-time into the top-right corner from 20 yards. Both teams battled manfully against an icy swirling wind and an understandably heavy pitch, in places. However, in the end, Whitby were rewarded for the hard work of their players and groundsman Eric Wilson in coming from behind and actually getting the game played, respectively. Whitby Town: Bland, King, Robinson (c), Burgess, Pell, McTiernan, Shepherd (Doran 71), Hopson, Brown (Nolan 67), Snaith, Hassan. Subs not used: Williams, Raby, Campbell. Whitby Co-operative WTFC Man Of The Match: James King.